Next morning, we left Kandy and drove to Nuwara Eliya. 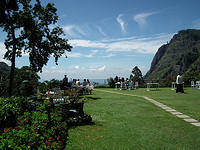 This area is high on the hill and is well known for the tea plantations. On route we stopped at one of many plantations and learned the process of making tea. We were also given a lovely pot of local Sri Lankan tea to enjoy in their tea garden. Of course we all bought a few boxes of local tea to take home. 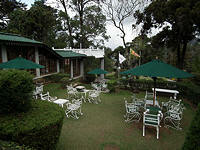 We arrived at Nuwara Eliya which is sometimes referred to as ‘Little England’. The landscape of this town consists of many green lawns, golf courses, lakes, red telephone boxes and rows of old English cottages or bungalows like a traditional English county village. The climate here is also a bit cooler like a warm summer day in UK. The strongest evidence of the British colonial style that remains to be found in this area are two hotels, the St Andrew’s Hotel and the Grand Hotel. The Grand Hotel is a vast mock Tudor building with garden tables and chairs under yellow parasols in a rose garden fitting perfectly with the English image. The immaculate lawn with flowers, bushes and roses in front of the hotel is serving afternoon tea from 15:30-17:30. The interior of the hotel has a reading lounge with a large fireplace and a wood-panelled billiards room. All the rooms are spacious and decorated in antique style. If you are staying at Grand hotel do not miss the Grand Indian restaurant just across the road. We had the best chicken tikka and fish curry there for our lunch. They were sensational. After lunch we decided not to travel to Nallathani for the evening-to-dawn Adam's Peak trekking expedition. Firstly the road is presently being reconstructed, and although the distance is not so far, the journey is very slow. Secondly we were not that keen to do the trekking, which is many hours of uphill climbing, starting late evening and arriving at the peak at sunrise. In peak season the walk can take even longer due to a large number of pilgrims on the path slowing down the pace. In low season the path lights may be turned off making walking more difficult. Instead we stayed at St Andrew’s hotel for the night. This manor house was once a planter’s club. 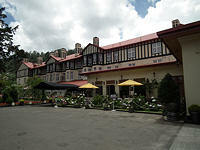 Today it is a luxury colonial style hotel high up on the hill overlooking the golf course. The interior consists of a drawing room with sofas and fire places, a library, a cocktail bar with a roaring fire, a billiards room and the Old Course restaurant. There is a tea room outside on the terraced green lawns with white iron garden tables and chairs. The garden surrounding the hotel is well kept and maintained with bedding flowers, shrubs and trees. All rooms are beautifully decorated in colonial style and comfortable. The food at the buffet dinner was also excellent. Next morning we left for Udawalawa. On the way we stopped at Ella, a small town on route, for a cup of tea at the wonderful garden of a simple small hotel called the Heritage Rest House. The setting of this hotel is quite remarkable with a garden leading to the edge overlooking the valley below and the mountain to the side. The mountain is called Little Adam's Peak and can be walked up in a shorter time than the more famous peak. A few hours trekking is all that is required for a day trip. Our guide also suggested that we can offer clients a train journey from Nuwara Eliya to Ella to cut back some of the driving especially as the train journey is through some very beautiful hill and countryside scenery. We are going to add this on to our 14 days Sri Lanka Ancient and Modern itinerary. We arrived at Udawalawa and checked in Grand Udawalawa hotel. We started our first safari in Udawalawa National Park that afternoon. Our guide had booked a jeep for us at an agreed price and we also picked up a government-employed park guide for our safari trip. This park guide was very useful with knowledge of the animals and where they were to be found. His service was included in the entrance fee but a good tip is expected at the end of his service. We began our safari driving along a dusty road with several other jeeps but very soon went in different directions to them. We came to a halt near a large male elephant standing close to the road side. Further on the other side of the field there was a female elephant with two young elephants with her plus another. The park guide told us that we are lucky today to see a young male elephant with tusks. 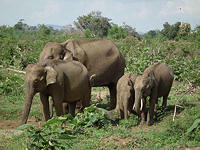 Afterward we saw an eagles, peacocks, kingfishers, bathing water buffalo and came across a second group of elephants. This time we could see how the elephants use their feet to kick the grass out of the ground before picking it up with their trunks to eat. 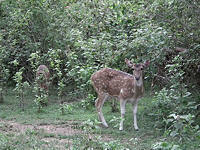 We also saw deer, rabbits, monkeys other birds. Next morning before we left Udawalawa we visited Kalu's Hideaway.